Cornog Plaza is now buzzing with activities focused on art and music. 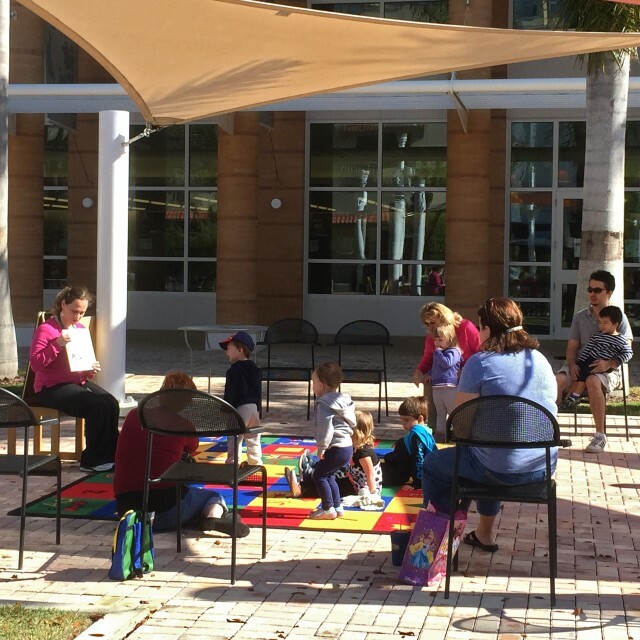 In 2015, Cornog Plaza, located on the grounds of the new Ft. Myers Regional Library, was a brand new public space in downtown Ft. Myers. Southwest Airlines Heart of the Community Program and Project for Public Spaces partnered up with the Lee County Library System to make their vision of an engaging, thriving Cornog Plaza a reality. Beyond just a place to meet friends and spend time, the partners aimed for it to be a downtown anchor where patrons can engage with the library. 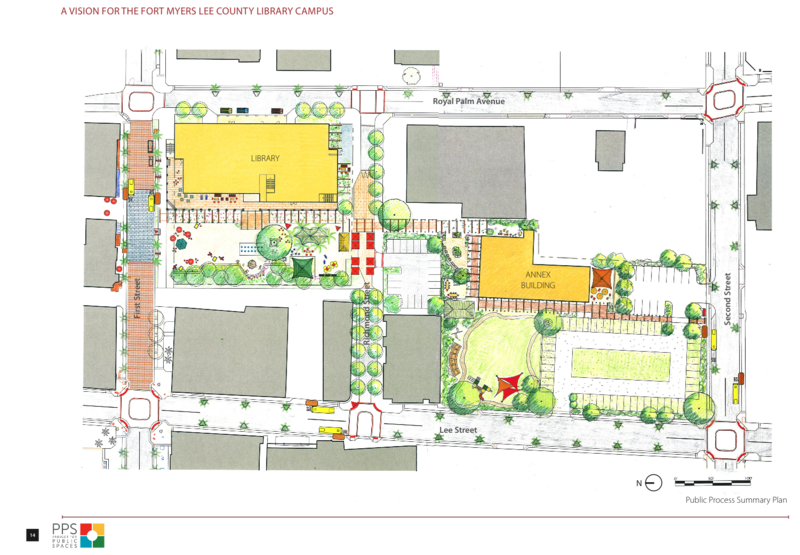 Even before the library was built, PPS was brought on to develop the concepts for the public spaces that would surround it, working off the goal for Cornog Plaza to become a vibrant community hub. PPS and its partners conducted surveys with library patrons, finding that many people wanted it to be a spot to cool down and relax: people requested umbrellas and shade, misters, and added greenery for the space. They also hoped for the space to host musical performances, food trucks, markets, and public art. As a result, game carts, giant chess sets, and brightly colored new tables and chairs were added to the space — quickly drawing in young visitors from nearby schools and camps. Public art took root in Cornog Plaza in the form of two bronze sculptures by Edgardo Carmona, linking the plaza with an exhibition that took over many spaces throughout the Fort Myers River District. 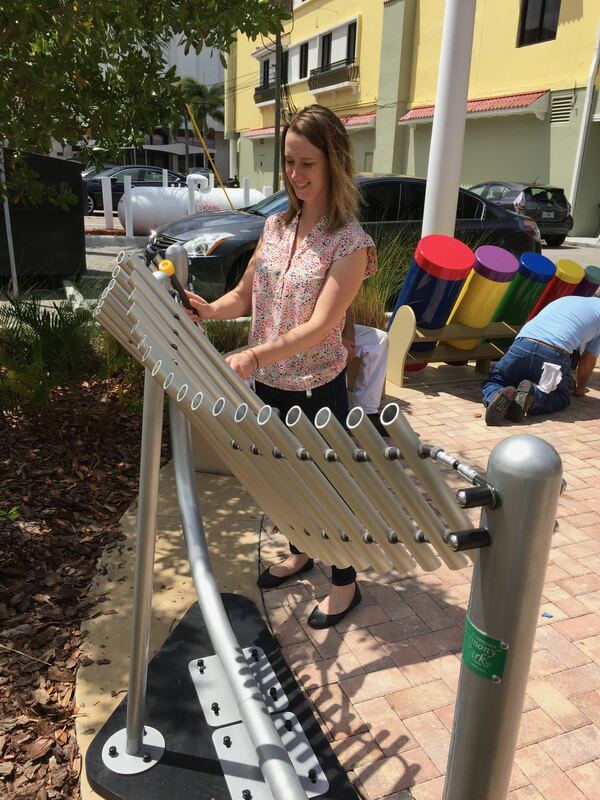 Reading nooks, musical instruments like a metallophone, an Artists@Work series showing off the work of different multi-media artists, and weaving and crocheting classes also began to attract locals to the plaza. The plaza even played host to dramatic readings of Edgar Allan Poe by members of the Florida Repertory Theatre! Eventually, a City Ordinance that had prohibited food trucks in the space was overturned, and food trucks were able to add to the festivities. A great new place for the library community and the people who live, work, play and relax in downtown Ft. Myers, Cornog Plaza’s new amenities and programs have made the space home to much more than the quick through-journeys of library visitors. Programming and kid-friendly activities engage people with the library and its surrounding space. PPS designs linked together the library and the surrounding plaza. Musical instruments bring added appeal to the plaza. Giant chess sets and moveable chairs attract people to Cornog Plaza.